If you are expecting long lines at your event and need crowd control stanchions for temporary use, we can help. We offer stanchion rentals for book and autograph signings, museum exhibits and display, concert events, product launches, car shows and more. If you need to keep the public in line and in control, stanchions serve that purpose. Options: Stanchion Top Signage, 11″ x 17″ portrait or landscape sign frame with 15″ x 9″ display area. Daily, Weekly and Weekend rentals are available in the Las Vegas area. Do you rent on a regular basis or is this a one time rental? Do you have the storage space available if you do purchase? 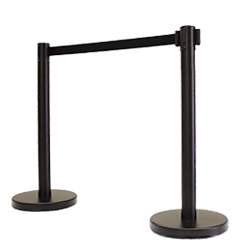 You can also purchase stanchions with an 11′ foot belt which will reduce the number of stanchions you need to set up. Most rental companies use shorter belt stanchions. Usually 6.5′ – 7.5′.